Scottsdale, AZ, USA, & Mumbai, India – September 14, 2016: Geometric Ltd. (BSE:532312, NSE:GEOMETRIC), a global leader in 3D CNC machining software, today announced a new release of their revolutionary technology that uses SOLIDWORKS® 3D DimXpert and Model Based Definition (MBD) 3D dimensions and annotations to automate the programming of CNC machined components. CAMWorks was uniquely architected to reduce a 3D solid model into a set of discrete machining features, and apply a knowledge base that selects tools, feeds, speeds, and machining strategies to automate the creation of CNC toolpaths. 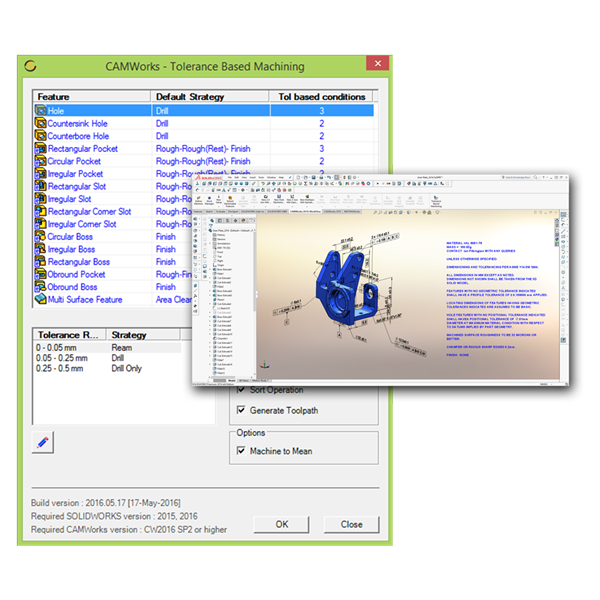 Tolerance Based Machining dramatically enhances CAMWorks core architecture by adding the ability to read and react to non-geometric manufacturing information such as tolerances, surface finish, and other annotations in 3D models. This ability not only speeds up the CNC programming process, and improvements in quality, but also creates a much stronger design-to-manufacturing process for machined components.